Becky Bellworthy, a 20 year old medical student from Southampton, had an ambition; to climb Everest and raise money for the charity Women for Women UK International. She researched, trained and fundraised for three years to fulfil her dream. One of the last hurdles she was presented with was travel insurance. She spent a long time looking for travel insurance for her epic trip, and only came up with a couple of possibilities. The best option she got was from an online quote from World First. She was asked to follow up her initial enquiry with a telephone call to Suzanne Rothwell, Senior Partner at World First to discuss the detail of her trip and travel insurance requirements. 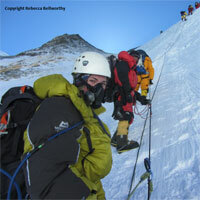 World First offered Becky a single trip policy for 56 days with cover for mountaineering over 4,000 metres. It cost £217, which turned out to be a very wise investment when Becky began to suffer from frostbite to her toes on her summit bid. But nonetheless she carried on to the peak to become the youngest British female to summit Everest. She and her Sherpa got back to basecamp from where Becky rode on horseback for a day to the village of Pangboche. She was then helicoptered to Lukla and finally flew out to Kathmandu where she received hospital treatment for frostbite and made daily trips to the clinic for new dressings for the next four days. Thanks to her excellent treatment she was able to fly home as originally planned. World First did offer Becky a Business Class return flight a day later but she chose to fly home as originally planned in order to get back to university for the start of term. Becky says, "I was thoroughly impressed by World First, I would certainly recommend them. They were quick to respond and showed attention to detail. They were so thoughtful and professional; things just seemed to happen without me having to request them. I appreciate the amount of instruction, liaison and communication needed and was grateful for their invaluable expertise." World First has settled a reserve on Becky's claim at £3,000, but more importantly our prompt and professional response, alongside our medical emergency provider, Mayday Assistance, has enabled Becky to make a full recovery from frostbite. Mountaineering ambitions now fulfilled, Becky is planning to swim the channel for charity when she finishes her studies at Southampton.